Having explained the benefits of the Toyota Production System in the last issue, it would be worthwhile to mention something about the Toyota recalls that occurred through 2009/10 and the steps taken to address the issues. Toyota initiated three separate but related recalls in late 2009 and early 2010, as a result of a fatal car crash. The first recall was in November 2009 to correct a possible incursion of an incorrect or out-of-place front driver’s side floor mat into the foot pedal well, which can cause pedal entrapment. In January 2010, the second recall was started after investigation showed that some crashes were not caused by pedal entrapment. Toyota also issued a separate recall for hybrid anti-lock brake software in February 2010. Toyota had recalled approximately 5.2 million vehicles by January 28, 2010, for the pedal entrapment/floor mat problem, with an additional 2.3 million vehicles for the accelerator pedal problem. Toyota recalled a further 1.8 million vehicles in Europe and 75,000 in China. By then, total recalls by Toyota stood at 9 million. At first glance this seems to be a major problem – 9 million cars recalled by the world’s most quality conscious manufacturer! Further investigation though shows a slightly different picture. Incidents of Unintended Acceleration can be reported by anyone to the National Highway Traffic Safety Administration (NHTSA). Depending on the year, Toyota has seen either more or fewer complaints of unintended acceleration than other carmakers, indicating that the problem is not unique to Toyota. A full review of the NHTSA database of 15,000 unintended acceleration complaints over the past decade showed that among all manufacturers, Volkswagen had the highest rate of unintended acceleration complaints in 2009 and 2008. 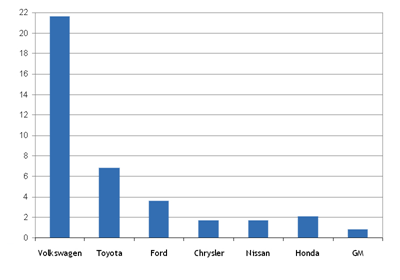 The chart below shows consumer complaints per 100,000 vehicles sold in 2008. So although the numbers of vehicle recalls may seem high for Toyota, the number of complaints for unintended acceleration was not out of the norm compared to other vehicle manufacturers over recent years. For Toyota the recalls came at a difficult time – like all vehicle manufacturers it was struggling to emerge from the recession and suffered from a decrease in sales. In the US it was estimated that each Toyota dealership could lose between US$1.75 million to US$2 million a month in revenue. Toyota Motors announced that it could face losses totalling as much as US$2 billion from lost output and sales worldwide. The company also suffered criticism from the media with commentators suggesting that emphasis on profits had resulted in manufacturing defects. A study by 30 NASA scientists released in January 2011 could not find any link between the electronic system and unintended acceleration. So it’s debatable if it was a real problem, media frenzy or something more sinister connected to the U.S government’s partial bailout of General Motors and Chrysler. In the final part in this series, we will discuss what steps Toyota has taken to ensure product quality remains the leading driver at Toyota.